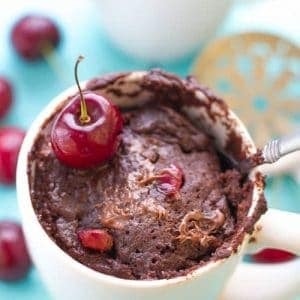 Moist and easy chocolate mug cake is vegan made with fresh cherries, chocolate almond milk, salted caramel and NO eggs. Cooks up in just over a minute and perfect for those late night chocolate cravings. My husband’s favorite dessert is chocolate cake and every so often he has a big craving for it. One night after we put the kiddos to bed, he was looking around in the fridge and freezer hoping to find any leftovers from one of my baking escapades. Nope. No luck. I had already given most of the desserts away at one of the barbecues we went to. He had a rough day earlier at the office and as much as I felt bad for him I really didn’t feel like turning on the oven to whip up a cake since it was so hot that night. This chocolate mug cake was the best way to whip up chocolate cake in a jiffy! It literally took about 5 minutes to put together, from start to finish and it totally satisfied that chocolate cake craving. Since then I’ve been having fun testing out all sorts of different flavors and this Chocolate Cherry Mug Cake was the latest one. This recipe makes the perfect single size cake which is key when you don’t want to have to worry about eating an entire cake. My favorite part has to be the spoonful of vegan salted caramel — you can totally use your favorite caramel sauce or certainly or even add another flavor like melted chocolate, peanut butter or Nutella which would give it that extra special something that can’t be beat! It goes perfectly with the diced sweet cherries and Almond Breeze’s Chocolate Almond Milk which added an extra rich and chocolatey boost of flavor. Just whisk together the ingredients, pop it in the microwave for a little over a minute and you get to enjoy an indulgent dessert perfect for those nights when you’re craving something sweet. Be sure to place the mug on a small plate or wide bowl in case of spillage. It doesn’t get easier than that! Just grab your favorite mug along with a spoon and you’re good to go! 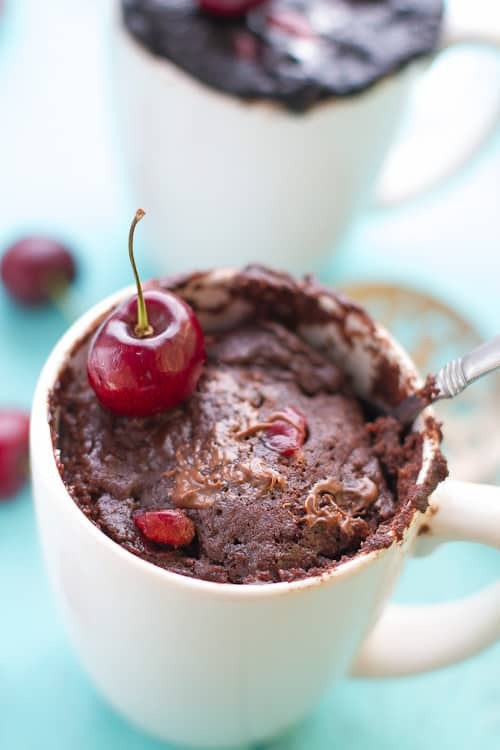 Easy chocolate mug cake recipe made with fresh cherries and no eggs. Cooks up super moist in just over a minute and perfect for those late night chocolate cravings. *In a medium bowl, whisk together the flour, cocoa powder, baking powder, sugar, and salt until combined. Do not mix directly in the mug! See notes. In a small measuring cup, whisk together the milk. vanilla extract and oil until combined. Pour over dry ingredients whisking well until batter is smooth. Gently fold in chopped cherries. 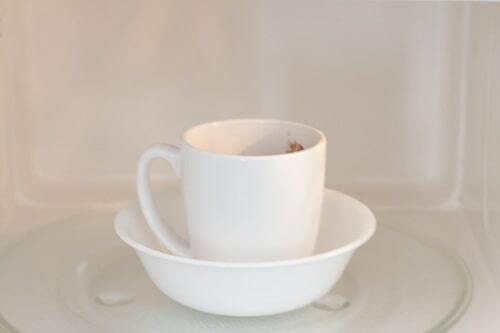 Transfer batter into a microwave safe cup. Top the mug cake with a 1/2 tablespoon of salted caramel. No need to push down as it will sink once it's heated up. Allow the mug to rest for about 30 seconds before removing from the microwave. Serve with additional fruit or ice cream if desired..
* Mixing the batter in a separate bowl instead of directly in the mug is is completely necessary to ensure the batter cooks up evenly. I have tried many times mixing everything in the mug and there is usually some uncooked flour on the bottom. ** The cooking times may vary according to your microwave power. Watch carefully and add or decrease the time as needed. Disclosure: This “Easy as Breeze” post is sponsored by Almond Breeze Almondmilk. All opinions are 100% my own. This mug cake looks amazing, Kelly! I love the chocolate and cherry combo. And the almond milk sounds delicious in here, too! What a perfect treat for when you just want a smaller serving! Kelly, I love that you used the chocolate almond milk for this! what a great idea!!! I love this and the added cherries! your hubby must be so happy. . now he can get his chocolate cake fix whenever he wants it!!! I’ve never made a mug cake before…but I do sometimes get crazy chocolate cravings and I ALWAYS have cherry cravings….so these look all kinds of ideal. Mug cakes are an amazing invention! YUM! Looove this single-serving mug cake, Kelly! It looks so ultra-moist and fudgy I just really want to dig a spoon straight into my screen! I LOVE chocolate + cherries! And so fun to do it in a mug cake form 🙂 Gorgeous! Hope you have a wonderful weekend Kelly! Yay for chocolate + cherry recipes! I think I’ve only made one mug cake ever …. time to give it a try again! This flavor sounds fantastic! Happy almost weekend Kelly! Firstly, I have to say that you have done such a good job photographing this. I can never photograph mug cakes without them looking a total mess. I am loving the flavour combo too. You can’t go wrong with chocolate and cherry. Aaw thanks Dannii! Chocolate and cherry for the win 🙂 Have a wonderful weekend! I want this mug cake so badly right now. Love chocolate and cherry together. Not to mention, this is such a great way to use almond milk and I have some in the fridge. Mug cake for breakfast? I think I will! Haha yes! It’s Friday so you totally can 🙂 Have a wonderful weekend Jen! I bet this hit the spot! And so quick and easy too! Chocolate and cherry are amazing together. This is a marvelous mug cake, Kelly. looks amazing Kelly and I love there are no eggs. I can never understand how recipes call for 1 egg in a single mug cake!! What a great dessert to pull together when you get a late night craving for chocolate. I could definitely use this recipe, a lot! Haha it’s so easy and dangerous at the same time 🙂 Have a great weekend! Chocolate and cherries and easy?!?! Sign me up! Haha thanks Rachelle! Have a great weekend! Thanks Keri 🙂 Have a wonderful weekend, Keri! Thanks Monica! Mug cakes are so much fun, my husband can’t get enough now since they’re so easy and he can make them himself 🙂 Hope you all have a great weekend! I can’t wait to show my daughter this recipe! She loves mug cakes and just went from eating vegetarian to eating vegan a few days ago. Yay, this sounds perfect for her 🙂 Have a great weekend Christin! Can you believe that I’ve never actually made a mug cake? Definitely need to try this, it looks perfect for those chocolate cravings! They are so easy it’s kind of dangerous haha. It totally made his day better 🙂 Thanks Katy, have a great weekend! Such a sweet cake, everything chocolate is my favorite! Oh my goodness. Chocolate Cherry Mug Cake?!? I need to make this for dessert. I love mug cakes and never thought about adding cherries to mine before! Genius Kelly! Mug cakes are the best! I love how this is vegan friendly too! Chocolate and cherry are the best combination. I definitely need to try this! Looks so delicious Kelly! I’ve never made a mug cake, but would love to try this one! So creative! Love this chocolate almond milk! Holy Moly, Kelly! Only 5 minutes to obtain this single serving size chocolate cake perfection??? My husband might leave me for you if I show him this!! Lol. Seriously, this is incredible and I LOVE the addition of cherries! I have never attempted to make a mug cake, even though I’ve seen them pop up all over the Internet. Yours has inspired me to change that. ASAP! Hope your husband is having better days at the office and you guys are having a great weekend!! Pinned! Cheers, sweetie! This mug cake looks absolutely fantastic, Kelly! Your hubby is a lucky guy 😉 I love the idea of mixing cherries into it…chocolate and cherries are a wonderful combo. Beautiful, Kelly! I can have chocolate cake in 5 minutes?! How awesome is that?! Looks delicious, Kelly! I love anything chocolate and cherry – this mug cake looks gorgeous Kelly! And the perfect way to satisfy those late night cravings! Wow!! This looks so indulgent and decadent, Kelly 😀 Mug cake are awesome! Who wouldn’t love a cake that can be ready in less than 5 minutes! Chocolate cherry.. Yummy! Just amazing! I made a wheat-free muffin in the microwave this morning & it was awesome! I love this concept and your recipe look super easy! I may have to tweak for myself! This makes me want to cry because I don’t have a microwave! This may be the best mug cake I’ve ever seen! I just baked some chocolate cherry cookies and love this flavor combo!